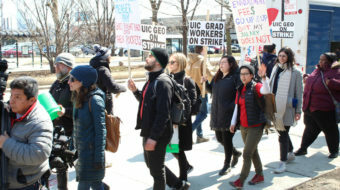 SPRINGFIELD, Ill. – More than 2,000 college students from across Illinois marched on the state Capitol to demand funding for more than 137,000 students whose Monetary Assistance Program grants were only funded for half the school year. A fearful governor and legislative leaders met Oct. 15 and agreed to pay the grants while stating they did not know where the money would come from in a state that has threatened layoffs of 2,500 workers. Forty-seven percent of the grant recipients come from families with an annual household income of less than $20,000; another 30% come from families with an annual household income of $20,000 to $40,000. In addition to serving less students this year with half as much money, there remain more than 150,000 additional financial aid applicants who also sought MAP this year and were turned down.